Where do I even begin with what we just experienced in East Texas? It all began with the wonderful front page article Cheril Vernon wrote for the Palestine Herald. During the phone interview she mentioned an opportunity for us to speak publicly and I quickly said we would absolutely be interested, but never held out much hope for this to come to fruition. Really, who wants to hear us speak on a random Tuesday at 10:30 am? Well, Ms. Vernon was true to her word and, with a second write up about us in the paper and following a personal phone call, rallied the Texas State Railroad Palestine Depot to be involved. 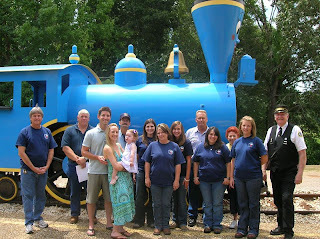 Lori Pennington, of the Palestine Depot, took us on with full vigor and created a media event on our behalf. Ms. Pennington went above and beyond to make us feel welcomed in Palestine and that our message is important. 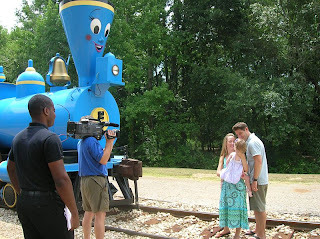 She had the Depot bring out their special blue "Little Engine That Could" train for Gwendolyn (and Gwendolyn loved hearing the whistle). They also prepared a darling gift bag for Gwendolyn, which she just adores. To our amazement CBS and ABC networks filmed the event and interviewed us for their nightly news, Cheril Vernon did an additional story, and KYYK-98.3FM radio did an on-air interview. We were also warmly greeted by a crowd, including the Palestine mayor, Bob Herrington. Bill and I each spoke briefly about SMA, Gwendolyn, and our belief that through awareness, SMA will go from being on the cusp of a cure to a curable disease. Following this whirlwind, as we spent the rest of the day exploring my family connections to Palestine and this historic town, we were continually greeted by different people, wished well, and handed donations. When we returned home to "R" Place RV Park, the owners Melinda and Peter greeted us with heartfelt kindness and word that they wanted to help by donating our entire stay with them to our drive. They also personally asked the other campers to contribute and handed out fliers about the petition. We had knocks on the door all evening from strangers who wanted to help. We are truly, truly humbled by the spirit of this area and their embracing of our efforts. We are so thankful and appreciative. And one I was so thrilled to share all of this with Harry and hear him feel so proud of his home town. Thank you Cheril, Lori, Mayor Herrington, "R" Place RV Park, and all the kind citizens of Palestine, Texas. Truly a touching and memorable day for us all!